Thousands of years of vast and captivating history holding some really startling and surprising mysteries. Some with bewildering and bemusing architecture – some are left in ruins and some parts of certain temples are gone missing. 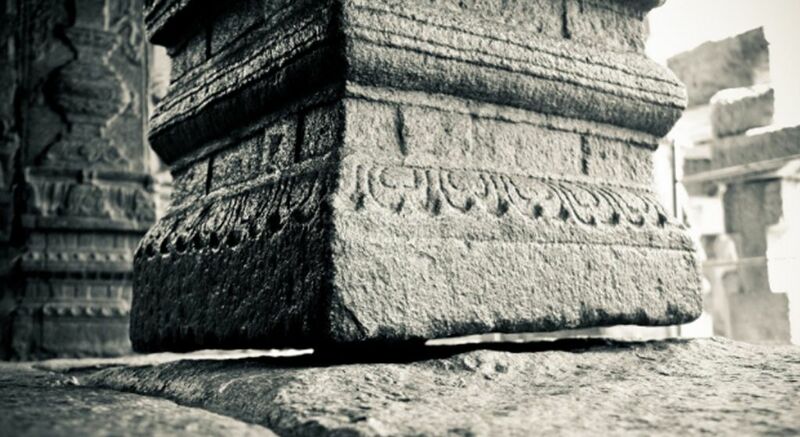 It isn’t about just the present or a couple of years back – some major elements of the age-old temples are still loaded with the unknown facts. There are several places that keep certain stories and elements still locked – much folklore accompanies their existence. The other-worldly lands of country India that preserves some of the finest aspects of architecture and development – less did we know [come!! Let’s find some more]. Years of existence but still some facts are under the cover with no explanation to clarify its presence. Visit places that introduces you to something which seems unreal but it’s just the opposite of your thought process. Dive into the past keeping in mind to what significance it holds in the date of the present. Visit some promising places standing tall in the striking and flourishing land of country India. The surprising height of the temples – more than ones thought are the count of the supporting pillars – tons of granite used during the construction; to witness someplace in real that showcases all the above factors, Make your way to India and surprise yourself with every turn taken in respect to exploration. With no machines, pieces of equipment or advance technology – how did the workers of the past managed to create something that touches the extreme limits – the fine stone carvings with no blueprints: these are some of the unanswered questions that are immortal in comparison to one’s existence. In this huge life-span – do make sure to dedicate some quality time to something that makes us feel closer to the greatness of the past. The time-worn days were the days of a great deal – with fewer amenities and pieces of equipment some major changes took place, which is still alive [some in best of their shape and some are left with just the remains] in every individuals thought. Until you visit – you won’t be able to relate exactly to what I am actually trying to express. Nation India is never in short of magical destination or events. Take the less travelled routes and discover the perfect hideout for your vacation. The richness of past is really astounding and breathtaking [mark your presence at significant spots that not only pleases your vision but also fills your mind with multiple questions. Life is like a roller-coaster ride – every turn in filled with strange creatures and situations. Run into the arms of past and fulfill all the demands of your heart. Count your steps and make your way to a sacred destination that also exhibits a great sample of awe-inspiring architecture. This huge piece of the remarkable temple [The Sun Temple] was built somewhere around in 1250 AD by the East Ganga King – Narsimhadeva. Not only in past but till date it continues to display an outstanding creation. Konark – this word is derived from the combination of two Sanskrit words, wherein Kona means “Corner or Angle” and Arka means “The Sun”. 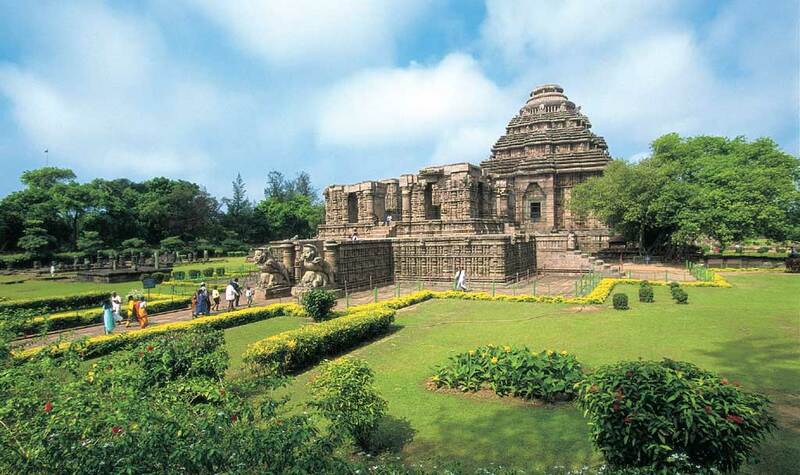 The Konark Sun Temple is a 13th century CE sun temple situated in Konark that is nearly 35 Kilometers northeast from Puri [a vital city lying in the arms of Odisha]. This enchanting temple is attributed to King Narasimhadeva first of the Eastern Ganga Dynasty. 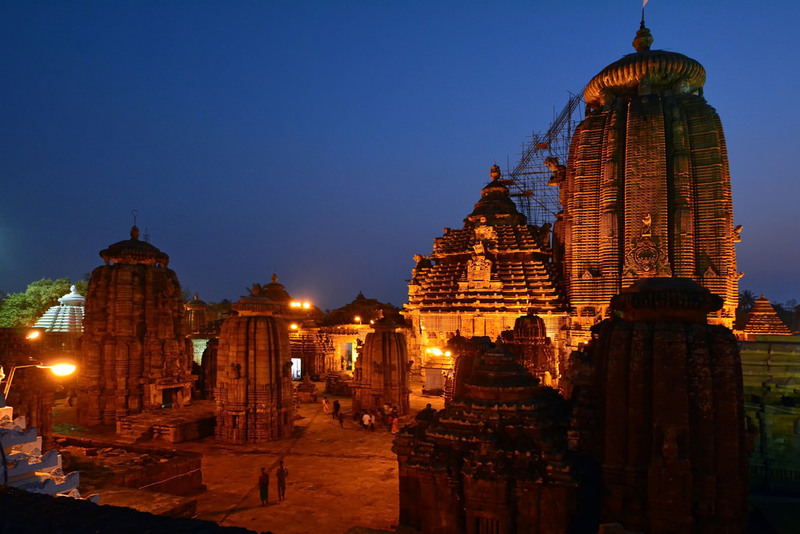 Witness the fascinating architecture of this temple that is made up of stones – a UNESCO recognized World Heritage Site. Explore the unique featured sculptures – take a keen look at the fine carvings – miniatures etc. 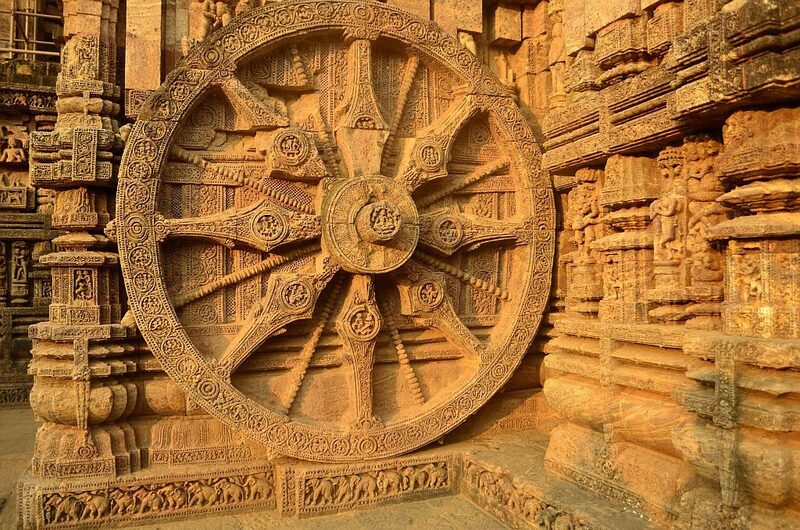 This fascinating temple is designed as a chariot which comprises of 24 wheels pulled by 7 horses [each of the large wheels has a diameter of 9 feet – 9 inches with 8 spokes]. A crucial part of this temple structure collapsed or was destroyed [no clarity] in the 17th century CE. It is widely believed that the section of the temple which was destroyed had a 52-ton magnet at the top. The influence of the magnet was so impactful that it had the potential to lift the main statue in the air. To add more to your knowledge or to add more thrill to one’s attention – the wheels of this temple are actually sundials [a device that tells you the time of the day]. Exact time can be calculated by the imposing shadows cast by the spokes. 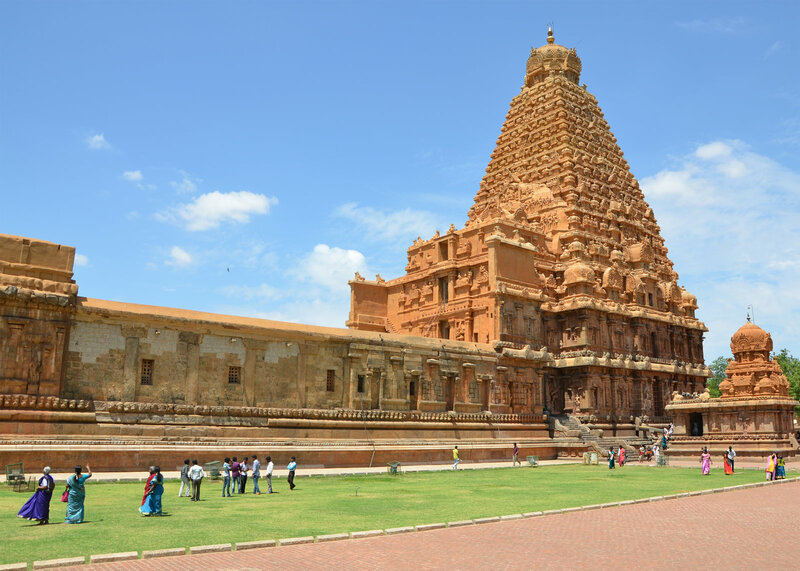 Several names with the same significance, this temple is also addressed as Rajarajesvaram or Peruvudaiyar Kovil [an enchanting Hindu Temple devoted to Lord Shiva] is situated in Thanjavur – an eminent city in the state of Tamil Nadu. 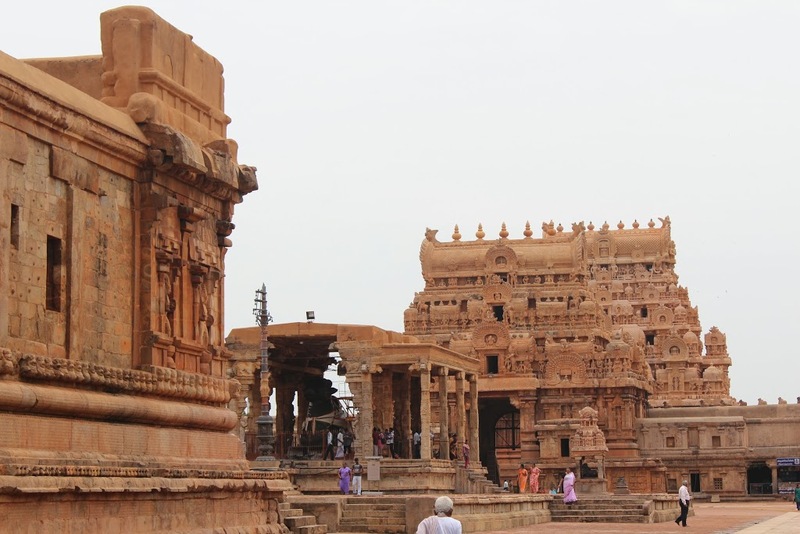 Pay a visit to a temple that portrays the finest of the Dravidian Architecture – this giant temple is the Seventh – largest Hindu Temple in terms of area [104,400 meter square] in the world. Brihadeeswara is one of the largest South Indian Temples, built by Raja Raja Chola first between 1003 and 1010 AD– a vital part of the “Great Living Chola Temples” recognized as a World Heritage Site by UNESCO. One has to literally lift his or her chin up in order to explore the enthralling charm of this startling piece of great work. Massive Corridors | Giant Tower | Inscriptions | Sculptures | Frescoes mainly related to Shaivism – some also acquire a touch of Shaktism and Vaishnavism traditions of Hinduism. The wide complex of this temple comprises the shrines of Goddess Parvati, Kartikeya, Ganesha, Nandi, Dakshinamurti, Sabhapati, Chandeshvara, Varahi etc. In the construction of this temple for nearly around 130,000 tons of Granite was used. The Round Apex Structure referred as the Kumbam is carved from a single Granite Rock –it sits atop the temple tower [weights approximately 80 tons]. The entrance Gopurams and the Nandi Mandapam which is situated to the Northeast of the courtyard exhibits a breathtaking view [aspects driving more attention and activeness]. And YES the temple tower addressed as the Vimanam is 66 meters tall – touching the extreme limits of the bluish skies. One has to bend itself in order to take a closure look of this enticing tower. 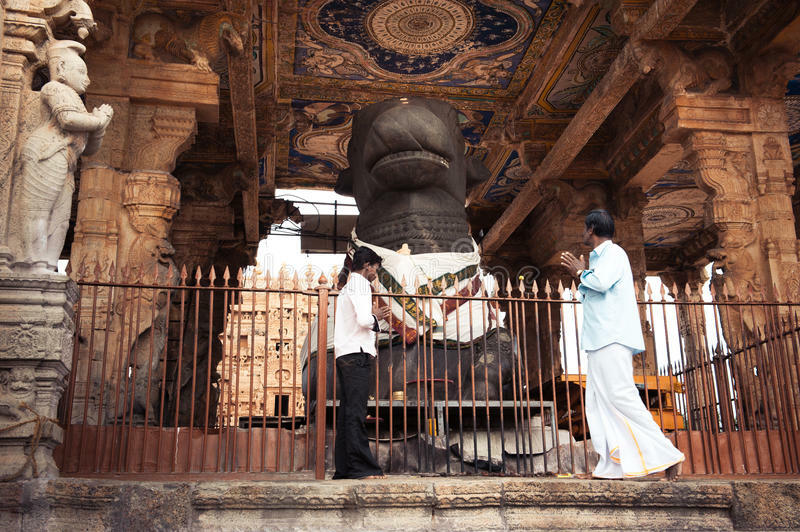 Watch your steps and turn the wheels to a temple that displays the best of Vijayanagara style. 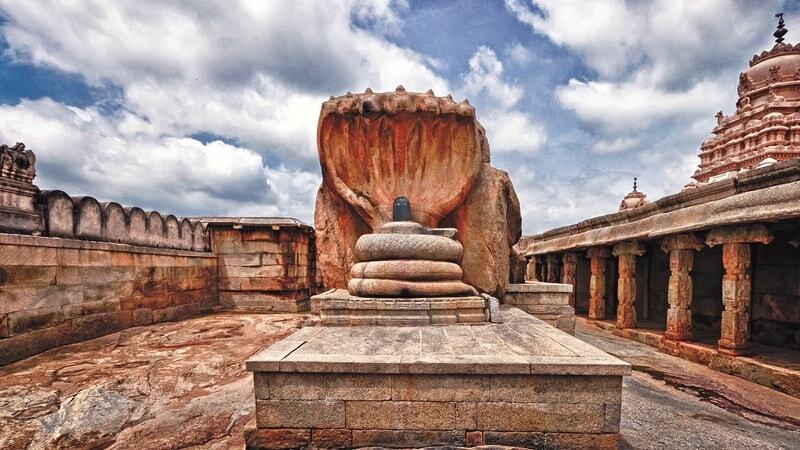 Speaking of which Veerabhadra Temple is situated in Lepakshi in the Anantapur district of the state of Andhra Pradesh. Explore a temple that features the best of its kind – built in the 16th Century. Witness the mind-blowing carvings and paintings that adorn the enthralling surface of the temple. One can easily spend a couple of hours exploring every corner of this remarkable and commendable temple [fresco paintings portraying the events belonging to the epic stories of Mahabharata, Ramayana and the Puranas]. A large statue of Nandi is situated at a distance of approximately 200 meters away from the temple, which is developed out of a single block of stone [considered as one of the largest of its type in the world]. Explore the captivating carvings of Lord Shiva and Vishnu on the pillars of the Mandapa. Witness the greatness of architecture with your bare eyes – the hooded serpent Naaga shading the huge lingam Sculpture. 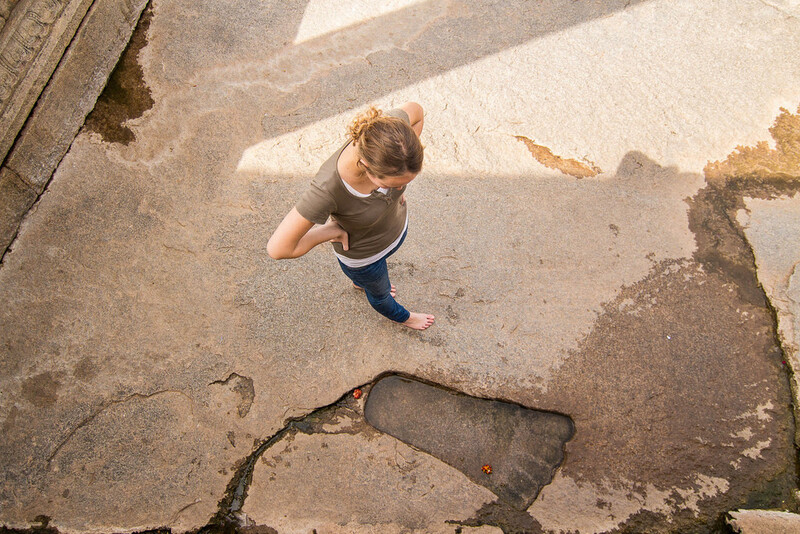 And YES do make sure to be a part of the mystery – witness the Giant footprint [3 feet long] widely believed that it’s the footprint of Lord Hanuman. Stand at any corner – one can count the numerous pillars supporting the roof [approximately 70 pillars]. To expand the width of your knowledge one corner pillar situated in the hall does not rest completely on the ground, there is a gap [the hanging pillar is just mystery]. Nothing in specific – There is no specific date of its origin. Make your way to a temple, which is considered as the Richest Temple in the World. The underground vaults are stuffed with richness. 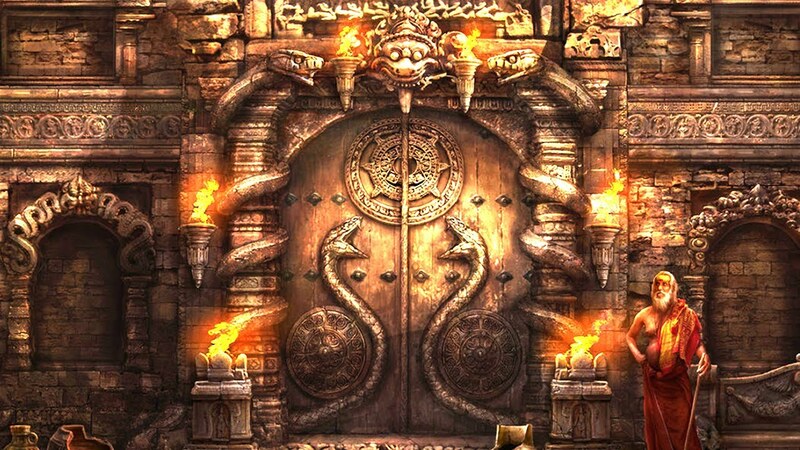 There are approximately 8 vaults in total among which some of the vaults are still closed with numerous mysteries in it [few doors sealed with a huge Iron Door]. Like literally some places have no means of access. 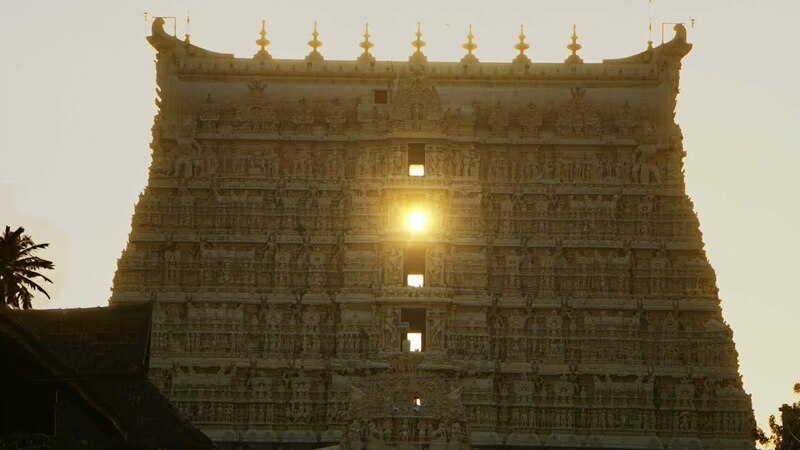 This glorifying temple is situated in Thiruvananthapuram [the capital and the largest city of the state of Kerala. The enchanting temple is constructed in an intricate blend of the indigenous Kerala pattern and the Tamil pattern of architecture related with the temples situated in the neighbouring state of Tamil Nadu, presenting high walls and YES a 16th-century Gopuram too. Once you make it all the way to the temple explore the imposing shrines that are adorned with..
Brahma Purana| Varaha Purana| Matsya Purana| Skanda Purana| Vayu Purana| Bhagavata Purana| Padma Purana and Mahabharata. 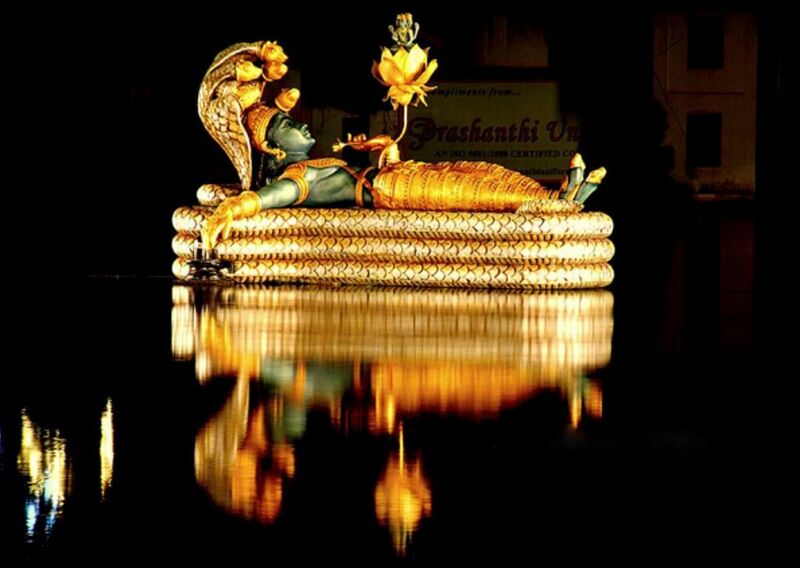 Embrace the influence of the principal deity Vishnu that is enshrined in the “Anantha Shayanam” posture [the eternal Yogic sleep on the serpent Adisheshan. 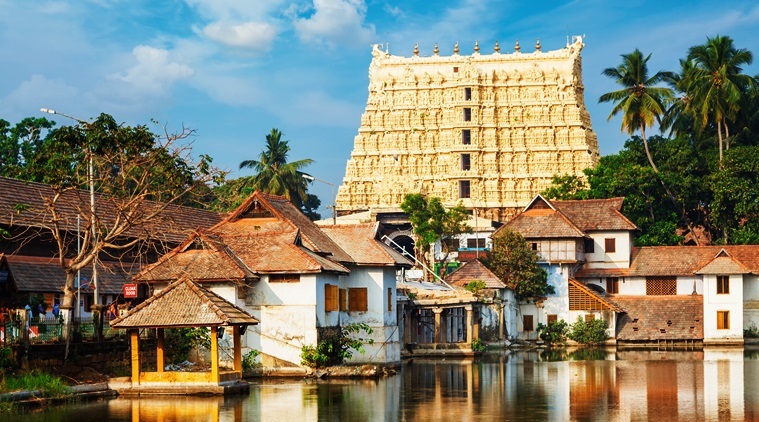 One of the interesting facts is the name of the city – Thiruvananthapuram [translation in Malayalam – “The city of Lord Ananta”], which refers to the deity of Padmanabhaswamy Temple. The accurate date of construction of this temple is unknown; however, the inscriptions on the stiff walls can be traced to 8th century CE. 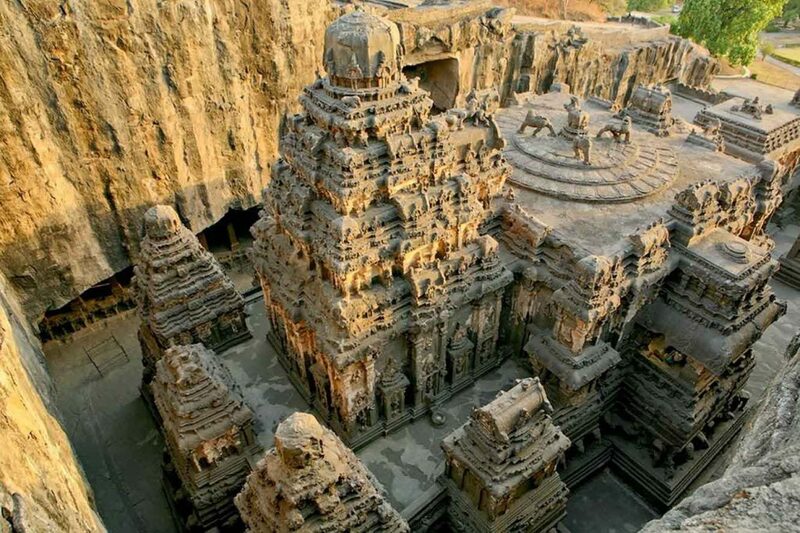 Kailash temple also addressed as the Kailasanatha Temple is way more imposing to ones thought –it’s one of the largest rock-cut ancient Hindu temples situated in Ellora in the state of Maharashtra. 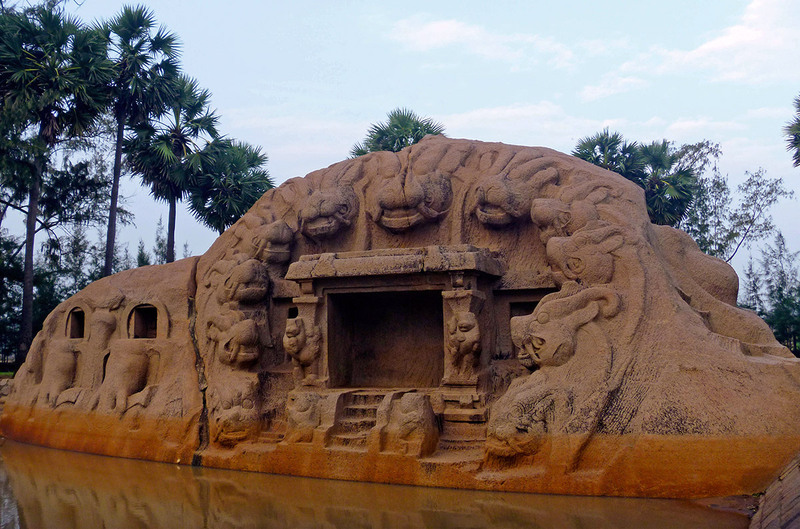 A Megalith that is quite nicely carved out of one single rock is considered as one of the most phenomenal cave temples in the incredible nation of India because of its striking architecture, size and sculptural treatment. The extraordinary Kailasanatha Temple is one of the 32 cave temples and monasteries, which when comes together or collectively are known as the Ellora Caves. 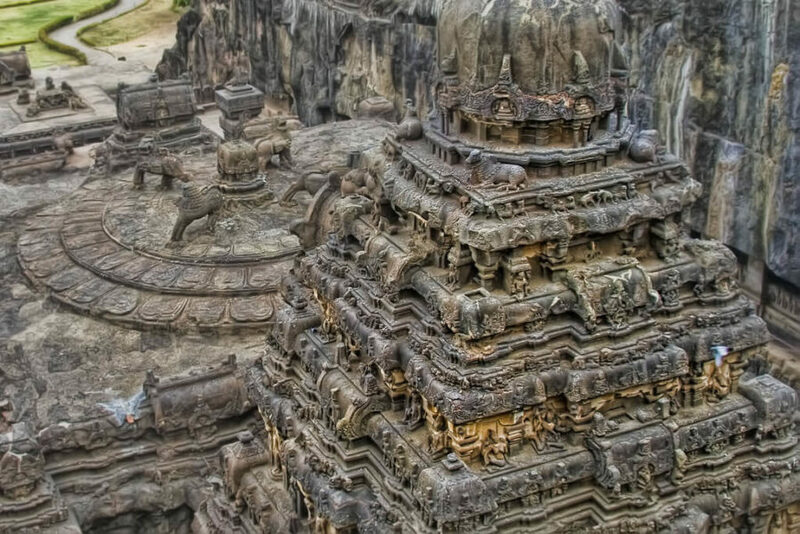 This temple architecture reveals traces of Pallava and Chalukyas styles. 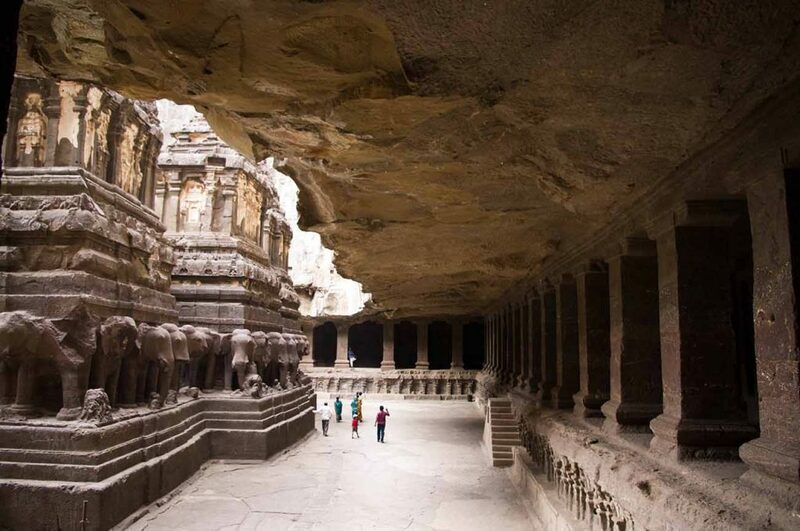 Pay a visit to this temple, which is located in the in the depth of the caves of Ellora. 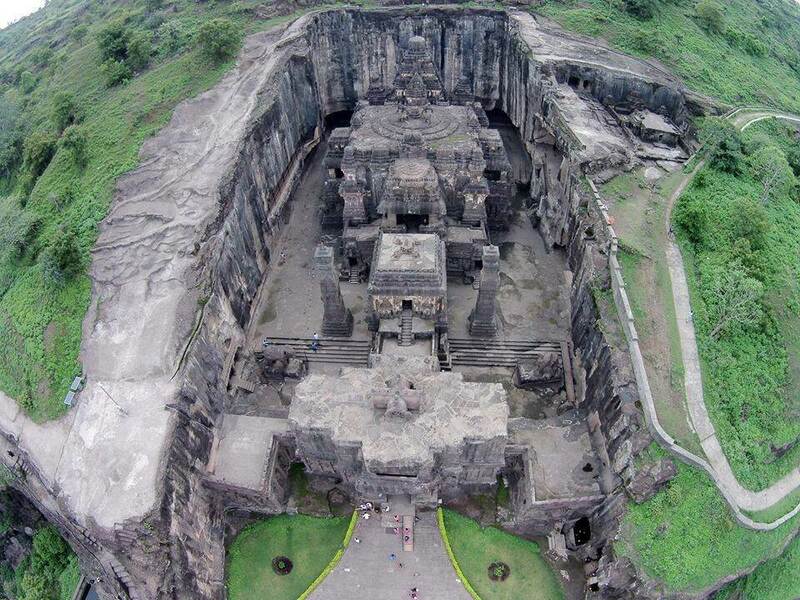 The Kailasa Temple is wider in the area and acquires the largest cantilevered rock ceiling in the world. 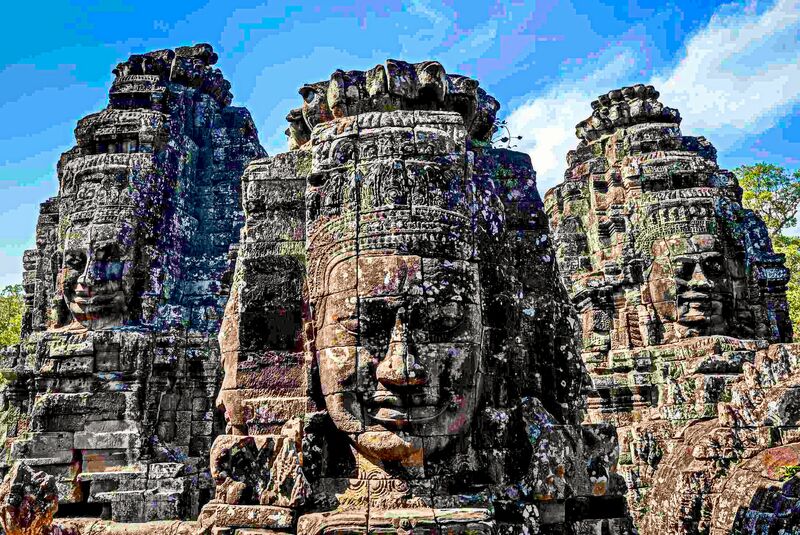 For nearly 400,000 tons of Rock has been removed from the wide complex of this temple. This place is again a great piece of achievement with respect to its surprising architecture [the carving of this temple is really enticing]. The distant look of this temple is also really Spectacular and impressive. The construction of this place of importance is generally credited to the 8th century Rashtrakuta King Krishna first in 756-773 CE. Run into the arms of mysteries and know few interesting facts or say witness in real to what is mentioned in the above-said lines. Country India is always ready to greet the presence of every single visitor – any time of the year works just fine when the utmost motive of travelling is to visit the Temples of India. Come along with your friends and family and travel back in time. For once make a move ahead in order to live in the stories that took place in real – way back to one’s understanding and knowledge.